Pretzel Logic's Market Charts and Analysis: Market Wants to Take Things "One Day at a Time"
Market Wants to Take Things "One Day at a Time"
It goes without saying that nobody wants to get caught looking up when it's time to look down, and vice-versa. This is especially challenging in a market such as this one, where the long-term picture is, quite frankly, ambiguous at best. 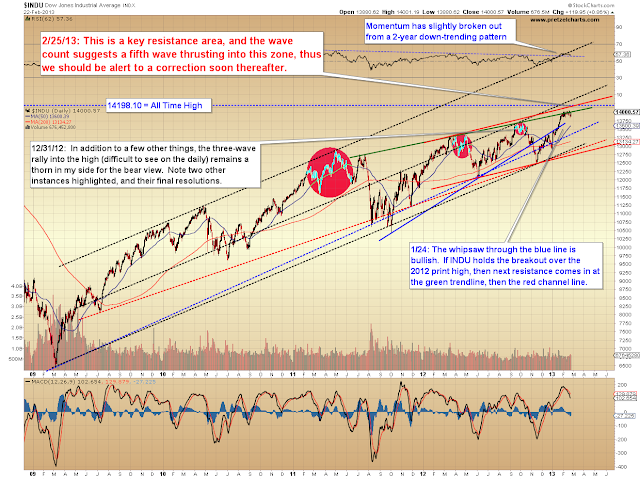 While the market's bullish intentions seemed fairly clear to me over the past couple months, the market has now reached a zone where (for the moment, anyway) we have to unravel the outlook on a day-by-day basis. I analyze charts first and fundamentals second -- but usually we have some type of fundamental backdrop from which to draw, which creates a reasonble overarching framework for the technical analysis. Either things are getting worse or they're getting better; either the economy is growing or it's dying (as any good entrepreneur will tell you, these are the only two real options in business: there is no status quo), and we can use that information as a waypoint for what then seems reasonable and likely within the charts. However, this is an unusually challenging market environment because equity rallies have been driven, in large part, by the world's central banks. On a fundamental level, the long-term outlook for this market seems to hinge almost solely on the outcome of inflation vs. deflation. If the central banks can maintain an inflationary environment, then equities will continue to rise; if they can't, or they choose not to, then equities will fall. And now we must add a technical ambiguity to the fundamental ambiguity, created by the very-long-term resistance zones which are being reached in most major indices, including the S&P 500 (SPX) and the Dow Jones Industrial Average (INDU). The mid-to-high 1500's have held SPX in check for more than a decade, and have rejected two prior rallies -- and both rejections then led to protracted bear markets. Accordingly, we have to view this area as strong resistance, and realize that any long-term decline which begins in this zone will, in retrospect, appear to have been blatantly obvious. I don't think we're quite "there" yet, and my preferred outlook does still expect higher prices. From a long-term perspective, I'm still slightly favoring the bulls as long as the Fed keeps the printing presses running at full throttle -- nevertheless, my confidence in the long-term is marginal at best, for the reasons outlined above, and I remain on alert for the bears to show up in force at any time. Last update's preferred count expected the market was closing in on completing a fourth wave correction, and after the SPX broke below 1510, it found support directly in the middle of the highlighted support zone on my 10-minute chart (1492-1503). Let's take a look at INDU first, because I feel the near-term pattern is a bit less ambiguous than SPX. 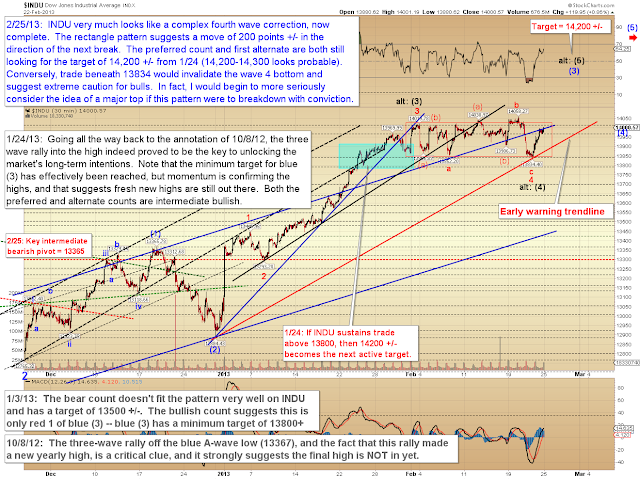 INDU appears to have completed a complex fourth wave flat correction, and if this is correct, it should be ready to move higher and into the next target zone of 14,200 +/- (not coincidentally, this lines up well with the all time historic high). 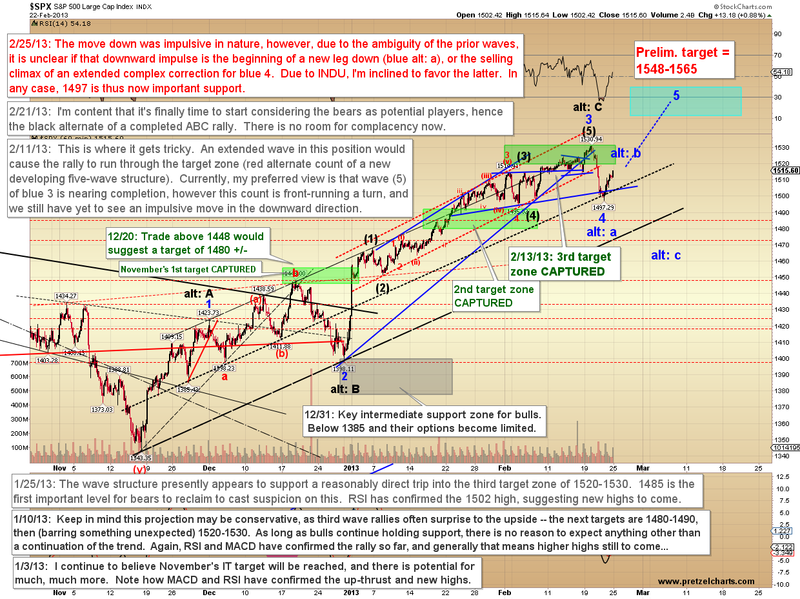 Unless the bears used up all their firepower on the recent drop, it's quite possible there will be a fair number of sell orders awaiting in this zone, and the wave counts are suggesting INDU is moving into a fifth wave rally (the final wave before a larger correction), so there's every reason for caution heading forward. We'll start with the long-term chart. Note the target zone from January lines up with the all-time high, which lines up well with the upper boundary of the red channel -- and thus bulls should be quite cautious as this zone is approached (assuming we get there, of course). It goes without saying that any sustained breakout through this zone would be bullish and suggest that my wave counts are too conservative, but normally I would expect to see a correction begin after this next thrust higher. On the shorter time-frames, both my preferred count and first alternate are viewing the recent low at 13,834 as the bottom of a fourth wave, though there is some question in my mind as to which degree that fourth wave is. Thus, both the preferred and alternate counts are near-term bullish, but suggest a correction is looming after the next thrust up. This remains a market where we have to unravel the intermediate term from the short-term, and the long-term still remains veiled -- but it pays to be aware that my bearish long-term count presently suggests the very real possibility that the market is approaching a long-term top. I would currently give that count better than 35% odds. The red trend line should provide early warning that something more immediately bearish may be afoot, while trade beneath the 13,834 low (prior to a new high) would invalidate both fourth wave counts. I'm going a little bit out on a limb here and not labeling an alternate count that shows the high as being in, but that is, of course, always a possibility. "Johnny, what can you make out of this?" And Johnny replies: "This? Well, I can make a hat, or a broach, or a pterodactyl..."
In conclusion, my preferred view is that the market recently completed a complex fourth wave correction, and is now in the midst of a fifth wave rally. There is no way to be of high-confidence in this view, however, because the prior decline was impulsive in nature (were it not for the INDU chart, I would probably be favoring further downside). As I mentioned earlier in this article, for the time being anyway, this is a market we have to take one day at a time. Trade safe. Nice pullback today on the SP500, thanks to Berlusconi and the Italian elections (according to the media). 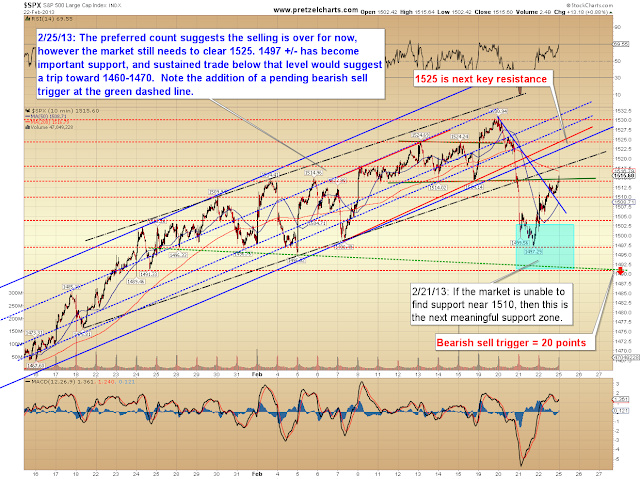 Wonder if we'll see a further continuation of the market pullback tomorrow? But then again. it wouldn't surprise me if the market bounced back again tomorrow erasing the entire pullback. It would certainly be nice to see a bit of a pullback which would allow investors to get on board for the final leg of this rally. Yes I do believe that higher prices are still to come as the FED continues its stimulus program. up in force at any time. Actually when someone doesn't be aware of afterward its up to other visitors that they will help, so here it takes place.